Registrar will likely end up as publicly traded firm after the acquisition. NameSilo has been acquired for $9.5 million plus earnouts. 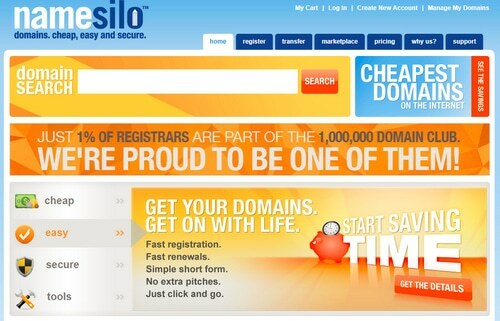 A Canadian investment firm has entered into an agreement to acquire domain name registrar NameSilo for $9.5 million plus undisclosed earnouts. The acquirer, Brisio Innovations, is a publicly traded penny stock on the alternative Canadian Securities Exchange. It plans to spin NameSilo out as its own publicly traded company on a Canadian stock exchange after the transaction closes. NameSilo had USD $11.1 million in annual recurring billings in 2017, up from $6.9 million in 2016. It has grown its domain names under management from approximately 745,000 domains at the beginning of 2017 to over 1.35 million today. The company boasts a customer retention rate of approximately 87%. According to the most recent public Verisign filing with ICANN (dating to November), NameSilo had about 850,000 .com domains registered. It had close to 50,000 new .com registrations that month. Unlike other recent acquisitions of domain name registrars, this one does not represent industry consolidation. Sad news as I’ve finished moving thousands of domains there. Soon they have to squeeze their customers for profit as a publicly traded company –> a change for the worse. And basically all registrars that got acquired either got worse or went down the drain. So many examples of it, moniker, fab, and recently enom. Tucows spent far more, 84mill on enom, and shortly after you couldn’t even get a reply from support until one to two months. I’ve stopped using escrow.com after they were acquired, everything just changed for the worse shortly after. Key person Brandon Abbey stayed on, just like the NS guys are staying on. He left shortly after though, as these ownership changes never go over well. No reason to believe NameSilo is going to be any different. Guess I’ll start looking for a new registrar home, again… sigh. In any organization, the principles by which it operates tend to flow from the top down, so time may tell. By the way, does anyone know what this “bigger discount” is for 100+ domains there? In short, this acquisition is much more of a financial play than operational. Our same founders who are the owner operators of NameSilo are staying on. There are no changes to our policies, support, infrastructure or plans. While we know that promises like this have been made by other companies, we hope to prove our dedication to our assurances. There should be no impact to our customers other than the introduction of new services down the road and increased support resources for our growing international customer-base. We are always happy to answer any questions/concerns. Why have you not answered my question about the “bigger discount”? Feel free to drop an email to support@namesilo.com with any other questions. Our average response time during business hours is just 6 minutes. Ok, saw your answer on TheDomains. I’ve had comments stuck in moderation before too. who was the seller / owner of NameSilo 90 days ago ?? Hello. Our ownership group has never changed since our inception. I’m disappointed that you still use green and red as your colors on your bulk domain search results page. These two colors are the number one color blindness and it affects almost 10% of males. I can’t even tell you how many more domains I would have bought from you guys if I could simply see the results on your screen. I’ve written into support about this before and they said they would do something but they obviously have not. How much was Enom purchase and number of domains? Apparently, it was $83.5 million and 14.5 million domains.